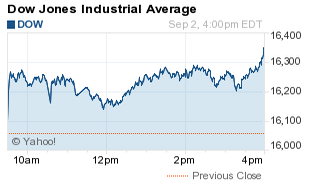 The Dow Jones Industrial Average today rallied more than 293 points as tech stocks rebounded from yesterday's downturn. The markets hit their highest level today after the U.S. Federal Reserve's Beige Book indicated that tightening in the labor markets could fuel wage gains in a number of U.S. sectors. This morning, ADP reported the U.S. private sector created 190,000 jobs in August, down from economist expectations of 201,000. Growing optimism over the U.S. economy has offset some concerns about stagnating growth in the Chinese economy. On Thursday and Friday, China's stock markets are closed for the World War II Victory Day parade. Banking and bond-issuing stocks surged today after Puerto Rico's public utility PREPA reached a deal with a group of bondholders over its massive debt. Shares of OFG Bancorp (NYSE: OFG) gained more than 19%, MBIA Inc. (NYSE: MBI) added more than 13%, and First Bancorp (NYSE: FBP) added nearly 10%. The S&P 500 Volatility Index (VIX), the market's fear gauge, fell 15.6% on the day. Stock Market News: Markets rallied on the backs of tech stocks, which saw big gains on the day. Shares of Apple Inc. (Nasdaq: AAPL) and Microsoft Corp. (Nasdaq: MSFT) were up more than 2.9% on the day, while Intel Corp. (Nasdaq: INTC) added 2.3%. Intel stock gained on news the company plans to overhaul its line of semiconductor chips. Meanwhile, energy stocks were in the black today due to gains in commodity prices. Shares of Exxon Mobil Corp. (NYSE: XOM) were up more than 1.6% on the day. Oil Moves: Domestic WTI oil prices moved higher this afternoon as Wall Street's rally negated concerns about an increase in U.S. oil supplies last week. WTI prices were up more than 1.2% to reach $45.97. Meanwhile, Brent oil prices added 1.7% to $50.40 per barrel. Prices remain under pressure as higher supplies and falling demand – principally in China – are weighing on global traders. Also in the news is OPEC's announcement that it's ready to work with producers outside the cartel to stop the oil price. Investors remain curious on whether OPEC will cut production. On Tap Thursday: Tomorrow, investors will keep an eye on the weekly jobless claims report, the U.S. Payroll to Population report prepared by Gallup, an update on international trade, and a speech by Minneapolis Federal Reserve Bank President Narayana Kocherlakota. Companies reporting earnings include Joy Global Inc. (NYSE: JOY), VeriFone Systems Inc. (NYSE: PAY), CIENA Corp. (Nasdaq: CIEN), Medtronic Plc. (NYSE: MDT), and Campbell Soup Co. (NYSE: CPB). Stocks to Watch No. 1, NFLX: Shares of Netflix Inc. (Nasdaq: NFLX) slipped 0.6% after the company was hit by a "short recommendation" from Citron Research. The stock is also under pressure after Apple announced it was exploring the possibility of creating its own original content. Stocks to Watch No. 2, AMBA: Shares of Ambarella Inc. (Nasdaq: AMBA) fell more than 8% after the chip maker announced risks to its future bottom line over concerns related to the third-quarter earnings report of GoPro Inc. (Nasdaq: GPRO). The firm announced quarterly per-share earnings of $0.88, topping Wall Street expectations of $0.80. The company also beat earnings estimates as well; however, the firm is one of GoPro's top semiconductor suppliers. GoPro stock fell more than 5.7% on the day after investment firm Raymond James said the semiconductor's recent 2015 outlook indicates GoPro will not launch any new product lines this year. Stocks to Watch No. 3, FB: The Facebook Inc. (Nasdaq: FB) stock price was up more than 2.6% Wednesday afternoon to $89.48 amid a moderate rebound in U.S. equities. Here are some of the biggest headlines that have moved FB stock recently, and why the stock was up on the day. Stocks to Watch No. 4, TUP: Shares of Tupperware Brands Corp. (NYSE: TUP) surged more than 6% after the containers maker announced it beat Wall Street quarterly sales expectations. The company said the rise of the U.S. dollar has affected its global sales. However, the company cited growth in France, Italy, and Indonesia as a reason why it beat quarterly expectations. Stocks to Watch No. 5, T: Shares of AT&T Inc. (NYSE: T) were up more than 1.5% on news that TRC Capital Corp. made an offer to purchase up to 3 million shares in the telecom company. This afternoon, the telecom giant advised shareholders to reject the offer.